The latest narrative pushed by the mainstream media is that veterans are racist. 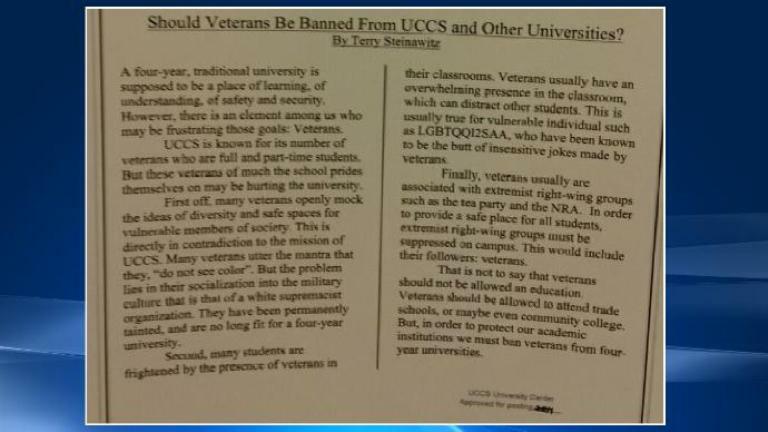 A flyer posted on the UCCS bulletin Board equated veterans with racists and suggested they be banned from 4 year institutions. Then there was the Huffington Post Article that suggested veterans were becoming racist by serving in our Armed Forces. The United States Military has the GI bill, which guarantees the education of our veterans. It’s the law. The flyer is openly illegal, and the HuffPo article part of the leftist agenda to name call anyone they don’t agree with. The newsletter is entitled: “Should Veterans Be Banned from UCCS and other Universities?” The flyer was not apparently posted by a student, and not endorsed by the school. The Chancellor of UCCS, Venkat Reddy, issued a statement in support of veterans. The viewpoints that the authors express are against the law. UCCS does not discriminate against veterans. But even more fundamentally, UCCS does not discriminate on the basis of race, ethnicity, gender, disability, religion, creed, veteran status, gender identity, gender expression, sexual orientation, political affiliation, or political philosophy. People earn the right to study at UCCS by virtue of hard work and individual effort, and we do not bar the door. The author feels that because a handful of veterans “provided security” for the White Nationalists at Charlottesville, and some even wore T-shirts with the Confederate flag on them, that’s a reason to place the label ‘racist’ on them. The author even blamed those views as coming from “PTSD” and it’s Trump’s fault. He even couched his premise with the words “brave”… but the damage from his article to people who assume a veteran is racist because of their struggles with PTSD, their service in combat, and their affinity to like Trump is horrific. Let’s be blunt here: such incendiary articles do a lot to feed things like that UCCS newsletter – a view that is openly illegal and unconstitutional. It’s an agenda – if you denigrate those who serve, if you name call your leaders, you tear at the fabric of the entire nation. The President did not “condone” the White Supremacists in any form. He called on both sides to stop the violence – something which was exactly true. But the left doesn’t want to hear it and has directed a landslide of hate at him. That the right is participating in it as well is something that should make us wary of the agenda they are all pushing.